It’s starting to get late, the sun is setting, and you wish you had got a start on your travels earlier in the day. You start to run to try to escape the forest before it gets dark out when you hear a cackle from behind some trees. You walk over tentatively when you’re greeted by a young witch sided by a Sableye and Bannette. You take a look in the direction she pointed and when you look back she is gone. The darkness is encroaching in on the night and you can start to hear the spiders stir in the trees. You take off running down the trail until you get to the fork. You start off down the left fork when you’re attacked by a dinosaur Pokemon. After recollecting yourself after a moment of terror you grab a Pokeball from the belt around your waist and throw it towards the monster. Seismitoad snaps into action lodging a brace around the dinosaur’s head and throws a net around the beast before punching it. The monster is momentarily subdued so you take off further down the trail alongside Seismitoad until you get a safe distance away from the monster. You turn around and see Seismitoad wincing on the ground with claw marks covering his battered body with his vegetable assassin standing over him. The Pokemon goes in with his jagged blade for the finishing blow, but right before it connects it’s tackled by an Entei. You summon Seismitoad back to its Pokeball and get the hell out of the forest. You weren’t ready for the terrors you found there. The world you thought you lived in is now gone, you were overpowered, not even Seismitoad could save you. 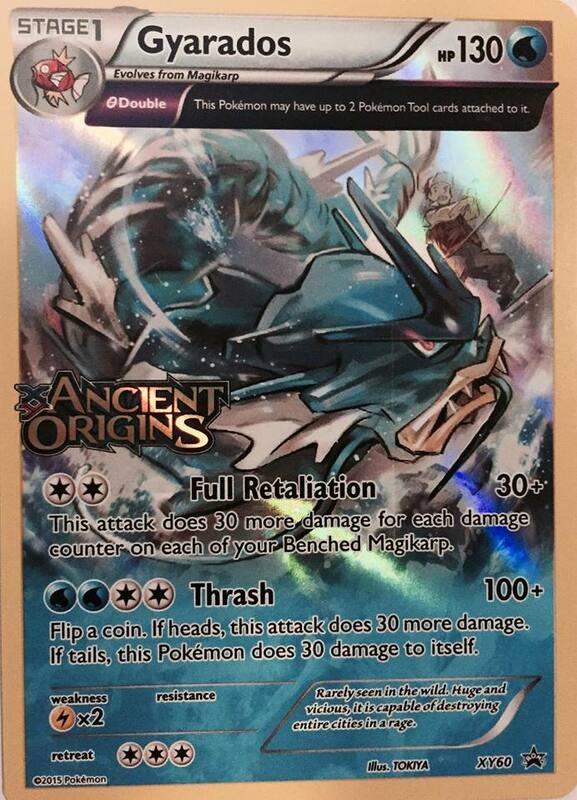 Ancient Origins is here, pre-releases are underway and the set will be officially released in stores on August 12th. It will become legal for play at the beginning of September and will be accompanied by the XY-on rotation for the Standard format. 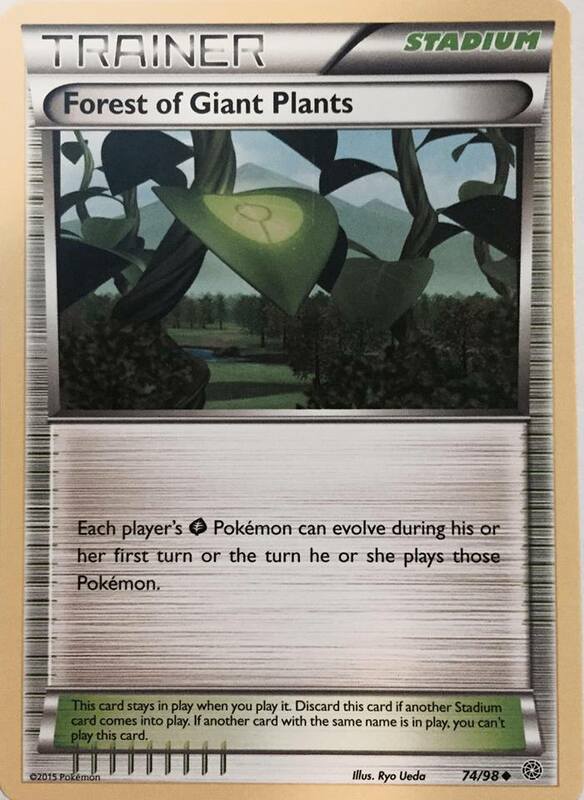 If you want to learn more about the Trainer and Special Energy cards in the set then make sure to check out part 1 of our Ancient Origins review: Manic in the Forest of Giant Plants – Reviewing the Trainers of Ancient Origins. 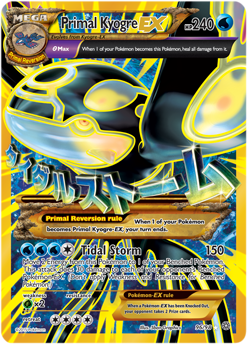 In this article, I will be going over the new Theta Ancient Traits, the pseudo reprints of the weather trio, and what I believe to be the top 20 Pokemon of Ancient Origins. Card scans for the new set have been scarce. I’ve uploaded ~60 cards from the set in an album on the Charizard Lounge Facebook page, so you can check out scans of most of the cards in the set there. If you want further updates, such as an update when articles are published to the site you can like the page to get updates right to your Facebook feed! Theta Double – This Pokemon can have 2 Pokemon Tools attached to it. Theta Max – When 1 of your Pokemon becomes this Pokemon, heal all damage from it. 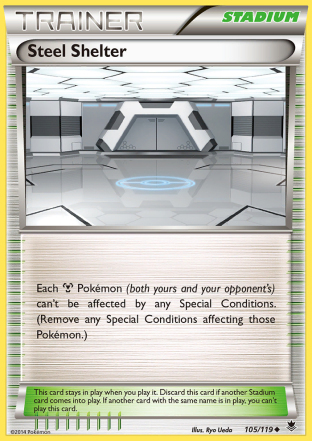 Theta Stop – Prevent all effects of your opponent’s Pokemon’s Abilities done to this Pokemon. All three of these traits are fairly powerful game effects and at least on first look, it appears that all three traits have ended up on at least one playable Pokemon having that trait. In total, there are 6 Pokemon with Theta Double, 6 Pokemon with Theta Stop, and 3 Pokemon with Theta Max. Theta Double is really cool and will allow for some better strategies with these Pokemon as there are a lot of playable Tool cards that do different things which could lead to some different strategies developing. If you want a large damage boost, you could attach two Muscle Band to one of these Pokemon. If you want a defensive strategy, you can attach two Hard Charm to a Pokemon. You can mix and match as well. M Tyranitar EX could leave the Spirit Link it had on it to evolve while playing another Tool, such as the aforementioned Muscle Band. Theta Stop only stops Abilities that directly target one of your Pokemon with the trait, such as Crawdaunt’s Unruly Claw, Crobat’s Surprise Bite, and Genesect EX’s Red Signal. I have a feeling that Pokemon largely designed this trait to be a soft counter to Crobat decks which have had a major impact on the meta game since Phantom Forces was released. When a Crobat deck plays against a deck playing Theta Stop on its primary Pokemon, a large portion of the Crobat deck instantly becomes near useless. I also wouldn’t be surprised if the introduction of this trait is hinting at some other powerful Abilities coming in the next few sets that directly target your opponent’s Pokemon. The last trait, Theta Max, seems underwhelming. In general you don’t want to attack with a Pokemon until it’s fully evolved, as you’re usually playing the highest evolution with your strategy based around that being in play and using that, not it’s pre-evolutions. For Theta Max to be effective, you would want to be attacking with the pre-evolution first and then evolve to the stronger evolution. 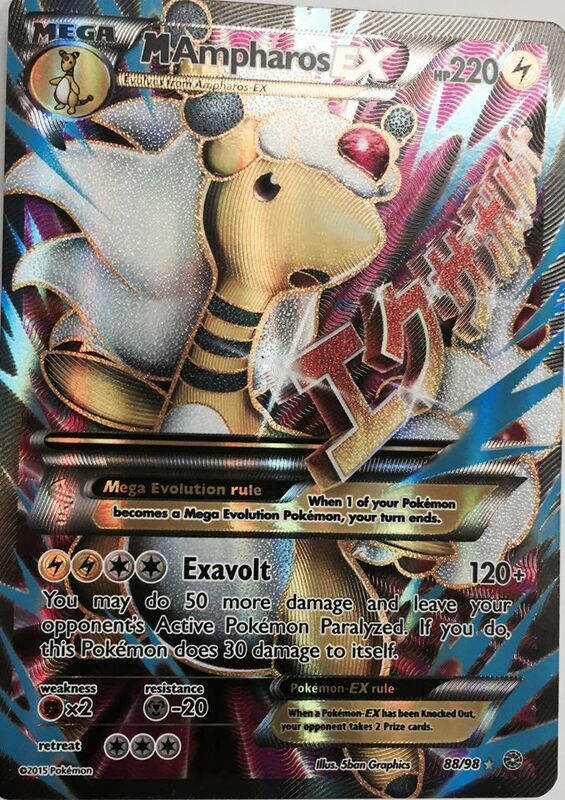 In Ancient Origins, this trait was exclusively printed on Mega EX’s. This is good in that the pre-evolutions will have enough HP to take a hit without being knocked out allowing you to use the trait to heal, but ultimately none of the pre-evolutions (Kyogre EX, Rayquaza EX, and Groudon EX) are Pokemon people would want to attack with so the only real reason you would end up with damage on them is if you’re just keeping them active to soak up damage, making this strategy useful on a very situation by situation basis. It is possible that I’m underrating how strong the pre-evolutions are and how effective strategies where you attack with them some before evolving into the Mega are, but I don’t think that will be the case because the pre-evolutions’ attacks are generally underwhelming and have somewhat high Energy costs. 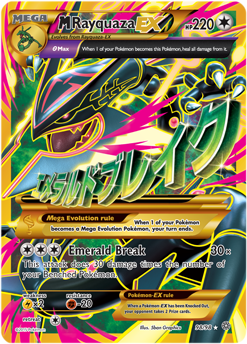 The Mega Ex’s for the weather trio – Groudon EX, Kyogre EX, and Rayquaza EX – have all received Shiny Full Art reprints in Ancient Origins, or more accurately, pseudo reprints. All of the text on the cards are the same with one exception, Pokemon changed the Ancient Traits on the cards. Primal Groudon was stripped of Omega Barrier, Primal Kyogre EX of Alpha Growth, and M Rayquaza EX of Delta Evolution. In place of their old traits, all three Pokemon have received the Theta Max trait. I don’t think the new versions of these cards will see heavy play. Having damage pre-existing on them before they evolved doesn’t happen that much and I feel their original Ancient Traits were big parts of their identity and a large part of what made the cards good in the first place. The leading candidate for using Theta Max effectively has to be M Rayquaza EX. Rayquaza EX (Colorless) has the easiest to use attacks of any of the pre-evolutions so I could see situations arising where Theta Max would be useful over Delta Evolution. For example, against Seismitoad EX decks you could use Intensifying Burn to place 60 damage on a Seismitoad EX, take in its Poison and Quaking Punch damage and then heal off all that damage when you evolve into M Rayquaza EX making it very difficult for the Seismitoad player to beat you. One thing going in these alternative traits favor is that they are being released in the same set as Hoopa EX, which lets you search out 3 EX Pokemon from your deck. With Hoopa EX in the fold you can easily play 1 copy of the alternative trait and have an easy way to search it out, even under Item lock, to evolve your Pokemon. I won’t be including these three Pokemon in the Top 20 rankings because they are very close to reprints of existing Pokemon that we already have. These cards are obviously good and would displace some of the other cards if I did include them, but I want to discuss some of the newer mechanics and strategies and not focus too much on stuff we already have. With these guys out of the way, let’s move onto the Top 20 Pokemon in the set. Golurk is a Psychic type Stage 1 Pokemon with 130 HP, the Theta Stop trait, a Darkness weakness, a Fighting resistance, and a four retreat cost. Its Ability, Double Type, says, “When this Pokemon is in play, it is both Psychic and Fighting type.” Its attack, Superpower, does 80 damage and you may do 40 more damage, and if you do this Pokemon does 20 damage to itself. It’s a very uniquely positioned card being able to go in as both Psychic and Fighting type as both types have varying degrees of support. As a Psychic type, its Ability wouldn’t be shutoff from Wobbuffet PHF and it could take advantage of Dimension Valley to lessen its attack cost. As a Fighting type, it can take advantage of Fighting Stadium and Strong Energy to boost damage and Focus Sash to save itself from OHKO’s. A four attack cost is very high, so Golurk will probably have a hard time finding a place in the format, but having a Psychic type that can use Focus Sash could be relevant after the next set when a ton of Mewtwo EX and M Mewtwo EX cards will be released, which will most likely be weak to Psychic. 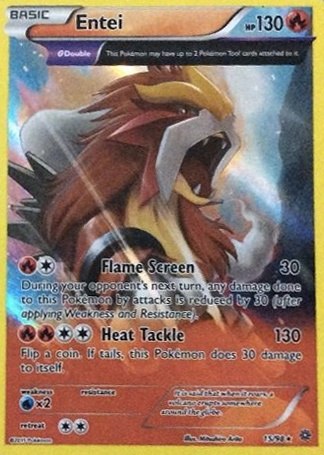 Entei is a Fire type Basic Pokemon with 130 HP, the Theta Double trait, with a Water weakness, no resistance, and a two retreat cost. Its first attack, Flame Screen, costs [R][C] and does 30 damage and reduces the attack damage done to it on your opponent’s next turn by 30. Its second attack, Heat Tackle, costs [R][R][C][C] and does 130 damage, and you flip a coin, if tails Entei does 30 damage to itself. With Grass Pokemon coming back in a big way, Seismitoad EX should start seeing much less play allowing Fire to re-establish itself in the meta game as well as allow Fire to act as a counter type to what will become one of the best types in the game. You would primarily want to use Entei for its second attack, which can be setup with a Double Colorless attachment and a Blacksmith for your Supporter. Thanks to its Theta Double Trait, it can attach two Muscle Band to hit for 170 damage or two Silver Bangle in Expanded to swing for 190. The Theta Double could also make it an interesting counter using its first attack. With two Silver Bangle, you could do 180 damage against Metal and Grass Pokemon with Flame Screen. I think Fire is a very interesting type that hasn’t been explored too much yet. In anything playing Battle Compressor, you can sneak in a few Fire Energy and a Blacksmith to setup a Pokemon like this. It’s not the type of thing I would expect to see played at a big tournament, but it’s the type of teching that can get you by in a smaller tournament. Registeel is a Metal type Basic Pokemon with 120 HP, a Fire weakness, Psychic resistance, and a three retreat cost. Its first attack, Iron Head, costs [M][C] and says to flip a coin until you get tails, and then you do 30 damage times the number of heads. 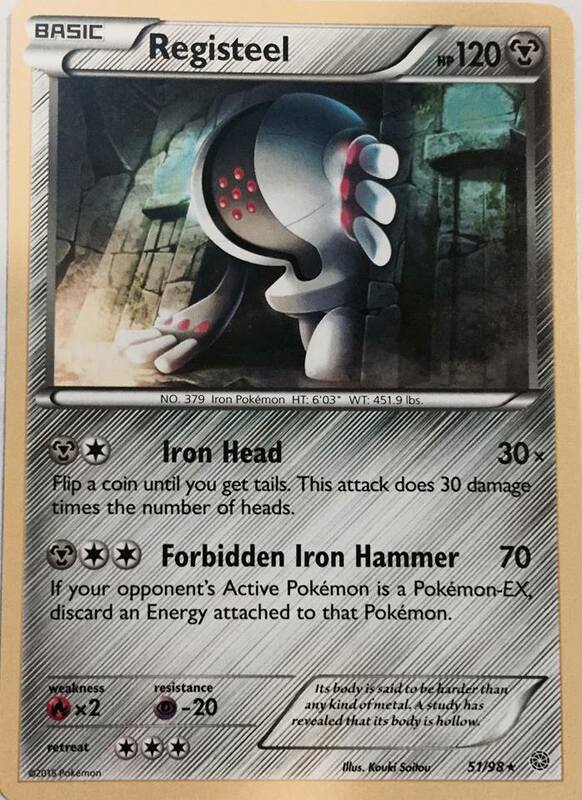 Its second attack, Forbidden Iron Hammer, costs [M][C][C] and does 70 damage and discards an Energy from the Defending Pokemon if it is a Pokemon EX. There should be no issue with getting Registeel setup in a Metal deck, and once setup, being able to discard an Energy from an EX is fairly solid, especially when Registeel is setting up a KO for another attacker against a Mega, or even taking a 2HKO on a regular EX. If your opponent has to attach another Energy to replace the one you knocked off, that sets them behind a turn of attachments which could help swing the game in your favor. Porygon Z is a Stage 2 Colorless Pokemon that evolves from Porygon 2. It has the Theta Stop Ancient Trait, a Fighting weakness, no resistance, and a two retreat cost. Its first attack, Digital Reboot, costs [C] and says, “Choose any number of Evolved Pokemon on your Bench. 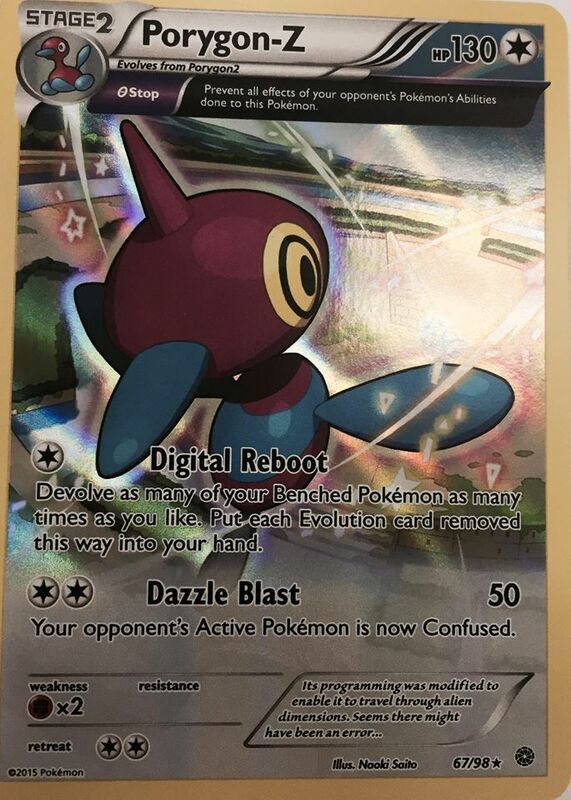 You may remove as many Evolution cards from those Pokemon as you like and put them into your hand.” Its second attack, Dazzle Blast, costs [C][C] and does 50 damage and Confuses your opponent’s Active Pokemon. Digital Reboot is one of the uniquest attacks we’ve had in the game and it will allow for deck ideas based around Pokemon with Abilities that trigger on evolution from hand to re-use those Abilities every single turn of the game. This would work with cards such as Crobat PHF, Shiftry NXD, Crawdaunt PCL, and Aggron DRX. 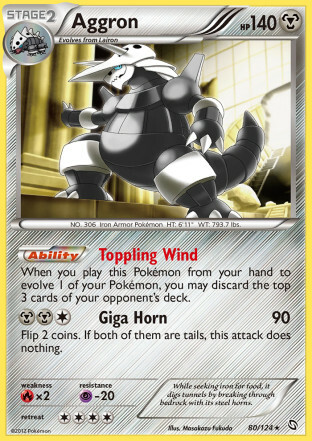 A card like Aggron with its Toppling Wind Ability, which discards the top 3 cards of your opponent’s deck when you evolve into Aggron from your hand, never quite ended up being good enough when supported by Devolution Spray because you couldn’t immediately play back down the Aggron after de-evolving it. Now with Porygon Z, you would be able to evolve into four Aggron and discard 12 cards from your opponent’s deck, then use Digital Reboot to de-evolve into Lairon’s and then evolve into four more Aggron on your next turn. This provides a much more consistent means of executing such a strategy than Devolution Spray could because of the limitation of being unable to re-evolve immediately. The downside of the card of course is that it’s a Stage 2, and the format hasn’t shifted to a point where a deck with a Stage 2 main attacker can thrive yet. I don’t foresee Unown seeing much play outside of decks that want to have Pokemon in the discard pile, such as Flareon or Vespiquen. It works in those decks because they need Pokemon in the discard pile, so it aides the deck’s main strategy, while also providing the benefit of being a draw card and allowing you to make use of mid and late game Level Balls to some positive effect instead of just burning them entirely if you’ve already gotten all usable Pokemon out of the deck for those balls. As a standalone draw card outside of the context of those decks, I found the card to be very poor. For example, when testing Shiftry Donk Deck in Expanded, the deck became much more consistent when I dropped all 4 Unown in the list in favor of Roller Skates. Trading 1 for 1 (or 2 for 1 in the case of using Level Ball to search it out) does nothing to establish a card advantage for you, keeping you either even or running you to a negative. Volcarona is a Fire type Stage 1 Pokemon with 100 HP, a Water weakness, no resistance, and a one retreat cost. Its first attack, Sunbath, costs [C] and says, “Search your deck for a Basic Pokemon and put it onto your bench. Then, attach up to 2 Basic Energy cards from your deck to that Pokemon.” Its second attack, Flamethrower, costs [R][C] and does 60 damage and forces you to discard an Energy attached to Volcarona. Sunbath is one of the strongest setup attacks that I’ve seen in this game. It is on a Stage 1 Pokemon, so in most cases you won’t get it until turn 2, but you can evolve into it with Wally for a turn 1 attack. Having a colorless attack cost is excellent and will allow Volcarona to be paired with any big basic Pokemon in the format. It is such a difficult attack to really judge how useful it will end up being as there are so many different forms of Energy Acceleration available in the format. I think it might find it’s best home with Vileplume decks for setting up attackers under the veil of Item lock. M Ampharos EX is a Lightning type Mega Pokemon with 220 HP, a Fighting weakness, a Metal resistance, and a three retreat cost. Its attack, Exavolt, costs [L][L][C][C], and does 120+ damage. You may do 50 more damage and then your opponent’s Active Pokemon becomes paralyzed and M Ampharos does 30 damage to itself. This is a really weird card that is super confusing in how they made it. It’s strange to see the attack paralyze the opponent’s Pokemon when it also does more damage. Ideally, M Ampharos would be played in a paralysis lock deck, but I think it will prove difficult to build an effective deck around that strategy. You would want Vileplume so they can’t play Items to Switch out of the lock, but a Mega with Vileplume would take up a lot of space and you would still need something extra, such as Greninja XY, Crobat PHF, or Dusknoir BCR to maintain a perfect lock. I don’t think there is enough room in a deck to properly work around the paralysis strategy. Doing 170 damage along with the paralysis effect is also problematic. That will OHKO a lot of things, so you might not even be able to effectively use paralysis as a strategy in many matchups. Against decks like Vespiquen or Raichu you will just take the knockout anyhow and then they can work on knocking out the M Ampharos on the next turn. Lastly, there are a lot more counters to a paralysis strategy than there were when decks like Vanilluxe NVI, Lilligant EPO, and Accelgor DEX were able to find success. In Standard there is Slurpuff XY, Steel Shelter, and Pokemon Center Lady. In Expanded, there is Virizion EX and Keldeo EX. Ultimately I think M Ampharos EX is fools gold, where it looks really good because it has a neat effect and there’s a lot going on with the attack, but ultimately it won’t be very effective for building a deck around. There are just other Megas with similar or better attack costs with better attacks and better support than M Ampharos has. 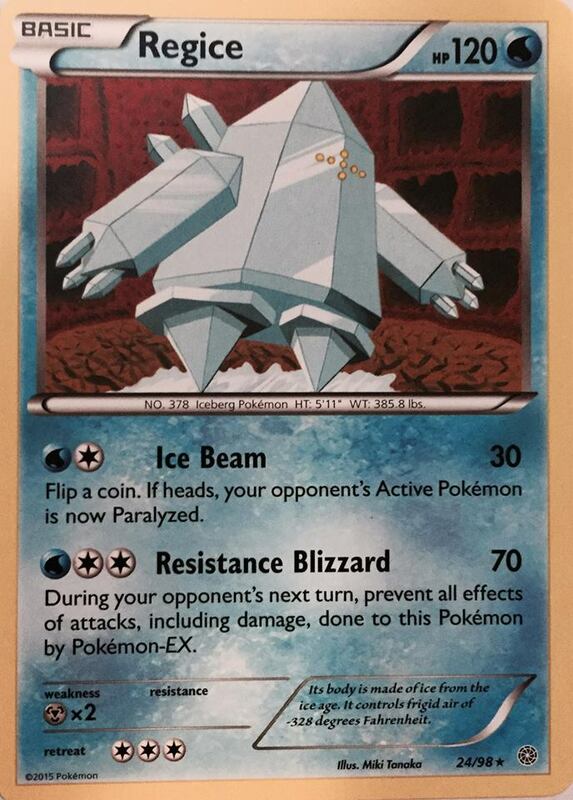 Regice is a Water type Basic Pokemon with 120 HP, a Metal weakness, no resistance, and a three retreat cost. Its first attack, Ice Beam, costs [W][C] and does 30 damage and has you flip a coin, if heads, the Defending Pokemon is paralyzed. Its second attack, Resistance Blizzard, costs [W][C][C] and does 70 damage and on your opponent’s next turn Regice isn’t affected by attacks from your opponent’s Pokemon EX. 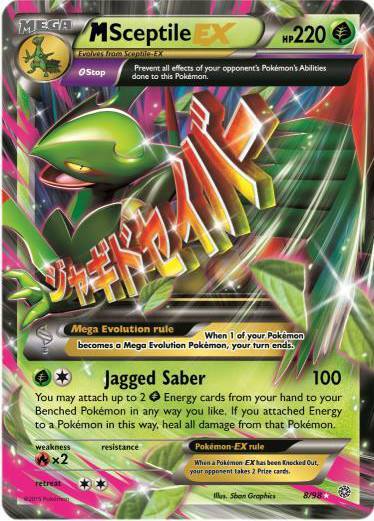 This will replace Suicune in something like Primal Kyogre EX as an EX hate card. While it can’t stall your opponent early game like Suicune could, it is much stronger than Suicune once you get it attacking because it can’t be shutoff by things like Silent Lab or Garbodor DRX. We saw a Hippowdon PRC deck make it into the Top 8 of the US National Championship this year with a similar attack. While Hippowdon has Fighting support to boost its attack power, I think that support is ultimately meaningless when comparing the cards because Regice can still take 2HKO’s on most stuff when it has a Muscle Band attached. In meta games where EX’s are seeing heavy play, Regice could be used in strategies that attempt to eliminate an opponent’s non-EX attacking options and then locking down a game with Regice, similar to the Hippowdon deck from US Nationals. 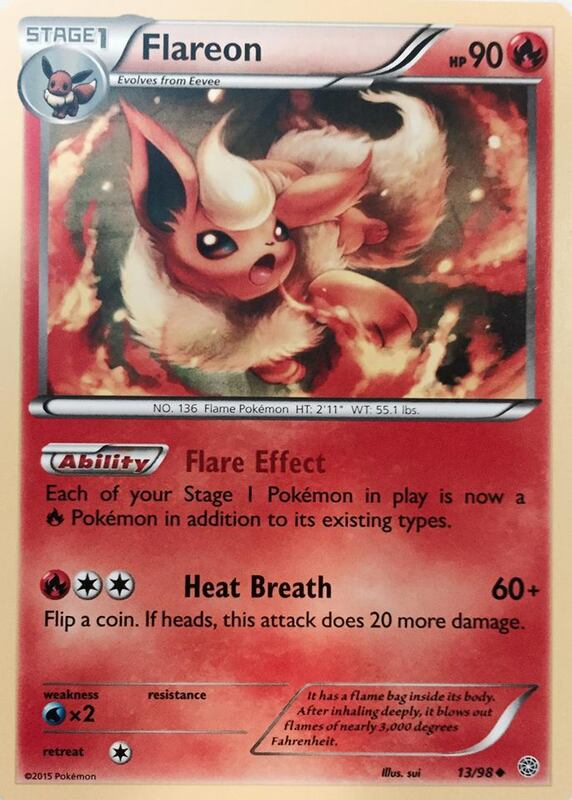 Pokemon has printed the three original Eeveelutions (Flareon, Jolteon, and Vaporeon) and they all have similar Abilities. Their Abilities Flare Effect, Electric Effect, and Aqua Effect all turn all Stage 1 Pokemon in play into the corresponding type as well as their original type. This will allow Stage 1 decks to hit a pretty good range of weaknesses by being able to add Fire, Lightning, and Water weaknesses into the mix, all of which could prove to be very useful. The most natural partner will be with Vespiquen to give you type coverage against four different weaknesses. This could greatly change some matchups that might have otherwise been poor. For example, if you play against a Landorus EX deck with a Raichu XY deck, you could play Vaporeon to OHKO the Landorus EX’s easily with Raichu. It’s worth noting that Jolteon has free retreat, so you can search it out when you start Eevee to move into your preferred attacker. All of them have 90 HP, so they can all be searched with Level Ball. 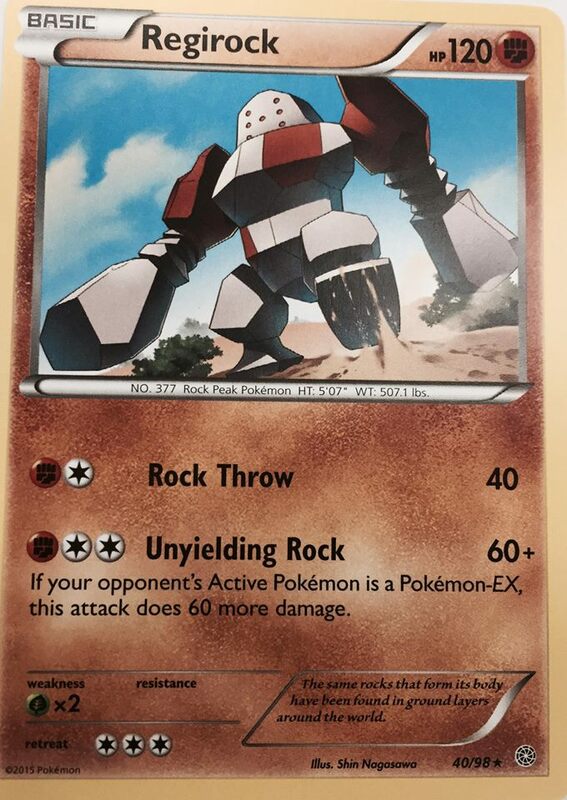 Regirock is a Fighting type Basic Pokemon with 120 HP, a Grass weakness, no resistance, and a three retreat cost. Its first attack, Rock Throw, costs [F][C] and does 40 damage. Its second attack, Unyielding Rock, costs [F][C][C] and does 60 damage plus 6o more damage if the Defending Pokemon is an EX. 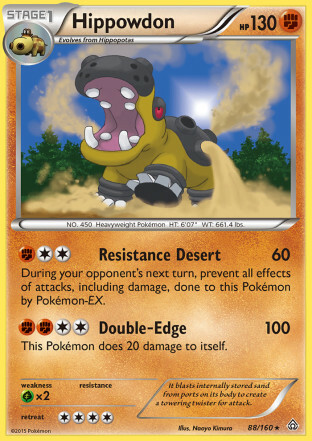 Unyielding Rock is the same attack as Gold Breaker, only instead of costing all colorless, it now takes a Fighting Energy to pull it off, which means Regirock won’t be able to be splashed into every deck like Bouffalant was able to do. 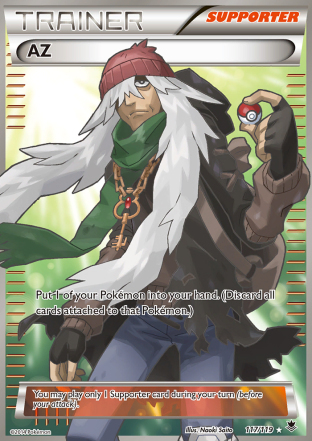 Bouffalant was very strong its entire time in the format, so I would expect Regirock to be strong for Fighting decks. Being Fighting type, Regirock will be able to take advantage of Strong Energy, Fighting Stadium, Focus Sash, and Machamp. I’m not exactly sure how Regirock will work in the context of a deck yet, but I would expect Fighting moving forward to focus its attention to playing Focus Sash more so than Muscle Band with Landorus EX rotating out of standard. This can be used in tandem with Hawlucha FFI and Landorus FFI to gain turns of attachment to setup a Pokemon like Regirock which needs two attachments to attack. Ariados is a Grass type Stage 1 Pokemon with 70 HP, a Fire weakness, no resistance, and a one retreat cost. 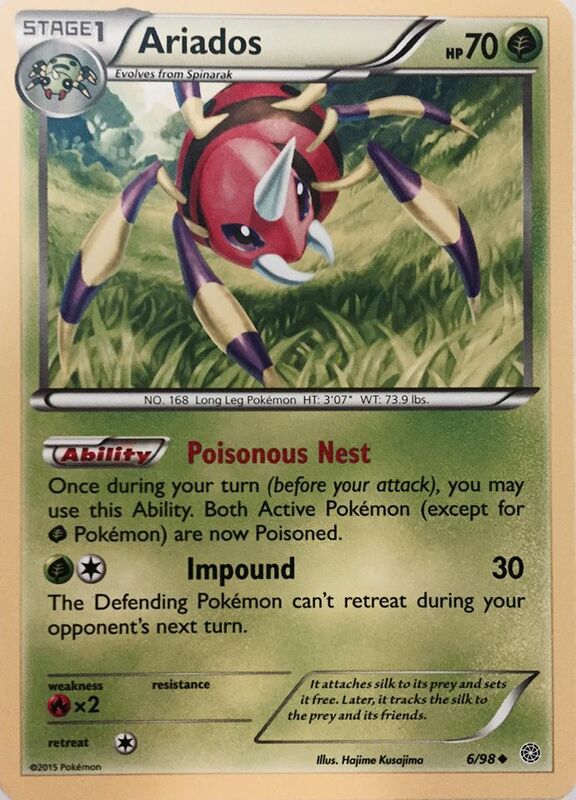 Its Ability, Poisonous Nest, says, “Once during your turn (before your attack) you may use this Ability. Both Active Pokemon are poisoned, excluding Grass Pokemon. Its attack, Impound, costs [G][C] and does 30 damage and says the Defending Pokemon can’t retreat. This is a really cool card which has a lot more utilities than I think people realize. 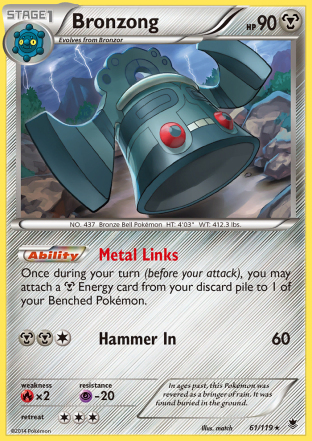 Obviously the card will fit in fine with Grass decks, but it can also work well with Machamp EX to boost the power of Crazy Hammer and with Metal Pokemon thanks to Steel Shelter. I think Ariados will shine brightest in Expanded where it can be paired with Virbank City Gym to make Poison do 30 damage in between turns. I could see a decks like Yveltal EX, which traditionally played Hypnotoxic Laser, dropping them in favor of Ariados if they play Keldeo EX. 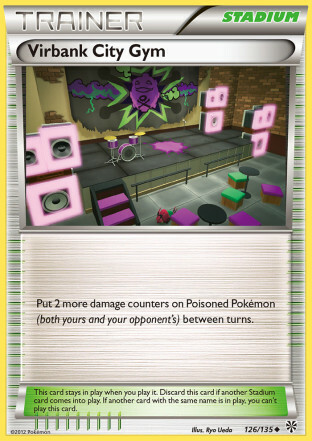 While Hypnotoxic Laser takes less setup and could put the opponent’s Pokemon to sleep, Ariados would allow these decks to poison the opponent’s Pokemon every turn ultimately resulting in more damage being done. In general, Ariados can work solidly with anything that has a free retreat component to it, such as Raichu XY, decks with Darkrai EX, or decks with Fairy Garden as you could Poison your own Pokemon and then retreat it to break out of the poison. While it most likely ends up having a large impact in Expanded when paired with Virbank, Poison is still a strong effect without Virbank. If your opponent isn’t getting their Poisoned Pokemon out of the Active position, the poison damage can still add up to a significant number. 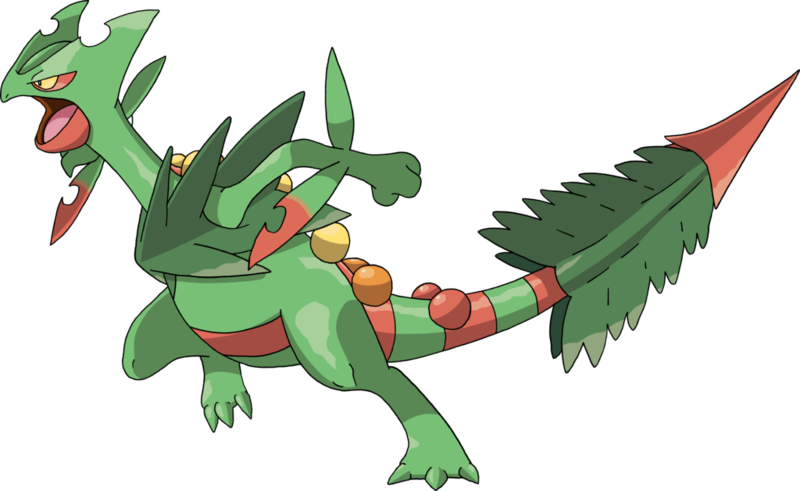 Sceptile EX is a Grass type Basic Pokmeon with 170 HP, a Fire weakness, no resistance, and a one retreat cost. Its first attack, Sleep Poison, costs [G] and does 10 damage and has you flip a coin, if heads the Defending Pokemon is Poisoned. 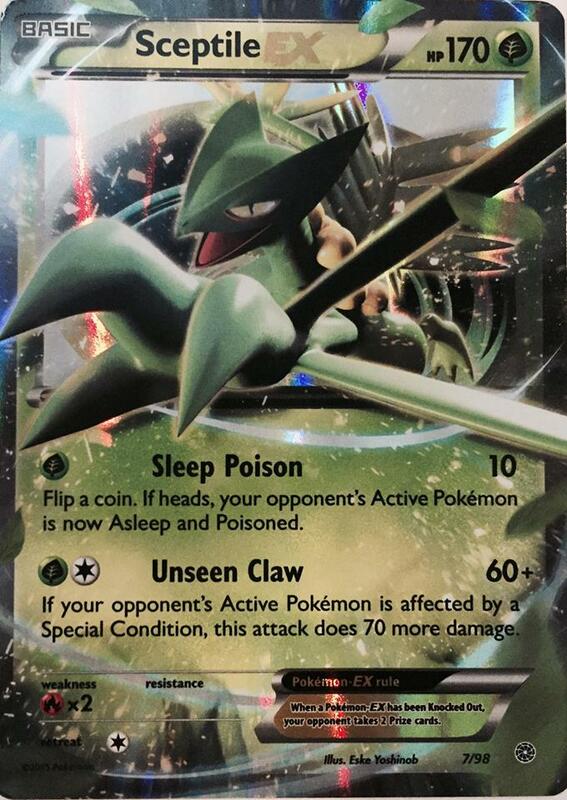 Its second attack, Unseen Claw, costs [G][C] does 60 damage plus 70 more damage if the Defending Pokemon is affected by a Special Condition. The damage output for Energy cost of Unseen Claw is excellent. Since Grass decks have Ariados, it will be easy to Poison the Defending Pokemon, so against any non-Grass decks, Sceptile EX should be able to swing for 130 (plus 10 more for poison). With Muscle Band that goes up to 150. In Expanded, if paired with Virbank City Gym, Unseen Claw easily becomes 180 damage, good for knocking out most EX’s. With a strong Basic attacker, I could see some M Sceptile decks being built with an emphasis on moving back and forth between M Sceptile and Sceptile EX with little regard for alternate attackers. 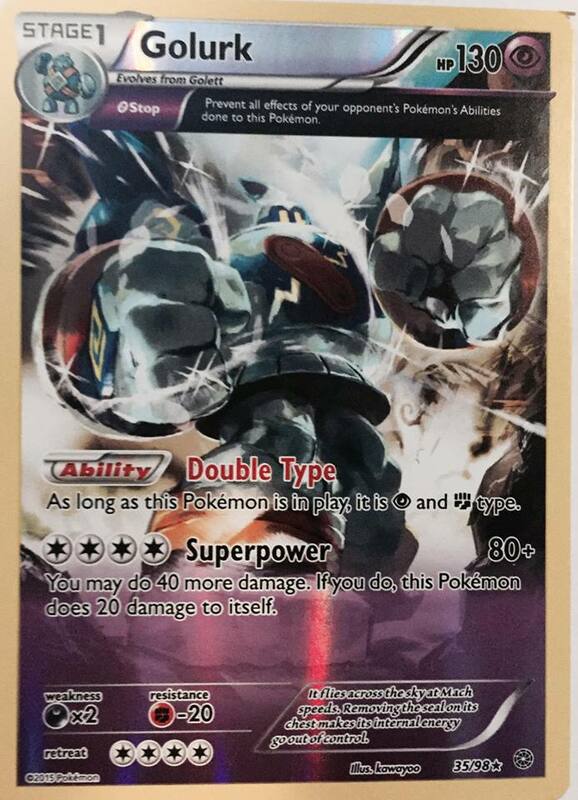 Machamp EX is a Fighting type Basic Pokemon with 180 HP, a Psychic weakness, no resistance, and a three retreat cost. Its first attack, Steaming Mad, costs [F][C] and does 20 damage times the number of damage counters on Machamp EX and then confuses Machamp. Its second attack, Crazy Hammer, costs [F][F][C] and does 80 damage, plus 80 more damage if Machamp is affected by a Special Condition, and then you remove that Special Condition. I think Machamp EX has two very strong attacks, but I think players will have a difficult time figuring out how to play it because Fighting doesn’t have any fast Energy acceleration at the moment. The best you can do right now is to probably use Landorus FFI to power up Machamp EX and then try to keep it alive with Focus Sash to make sure the time you spend powering it up with Landorus isn’t for naught. 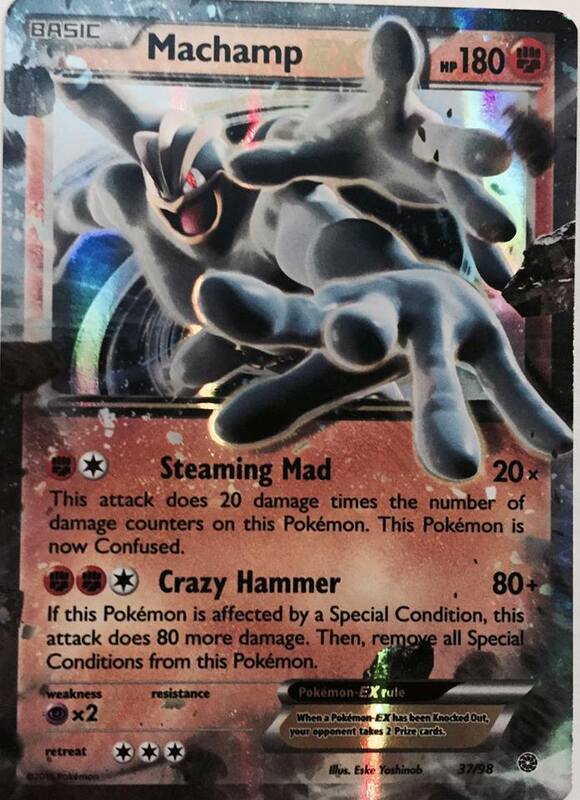 Crazy Hammer is a very strong attack, being able to do 160 damage when when Machamp is affected by a Special Condition. That becomes 170 after Poison, and potentially 190 with a Muscle Band attached. Being a Fighting type, there are plenty of damage modifiers available to Machamp to boost it further. Strong Energy and Fighting Stadium can all increase the output by 20 damage each, and Virbank City Gym could also increase the damage output by 20 in Expanded. There are four Special Conditions in the game, but Poison is the only one you can base a strategy around. You wouldn’t be able to attack if Machamp were asleep or paralyzed, and if Machamp were confused, you would only have a 50% probability of having a successful attack. Poison would be the only condition that would allow Machamp to use Crazy Hammer uninhibited. Good thing for Machamp the new Ariados that was printed in this set can Poison Machamp EX every turn of the game allowing you to consistently Crazy Hammer for big damage. Outrage style attacks are also generally strong, especially on a Pokemon with lots of HP. Steaming Mad is the strongest Outrage style attack that we will have in the format and will put any decks that rely on 2HKO’s in a bind as Machamp will likely be able to swing back for a OHKO with Thrash if they try to 2HKO it. Overall, I view Machamp EX as a card with two very strong attacks who will be difficult to figure out how to play because of awkward Energy costs for a type lacking good acceleration. Ultimately I think the strength of the attacks will pull through and players will figure out a good way to play Machamp EX. 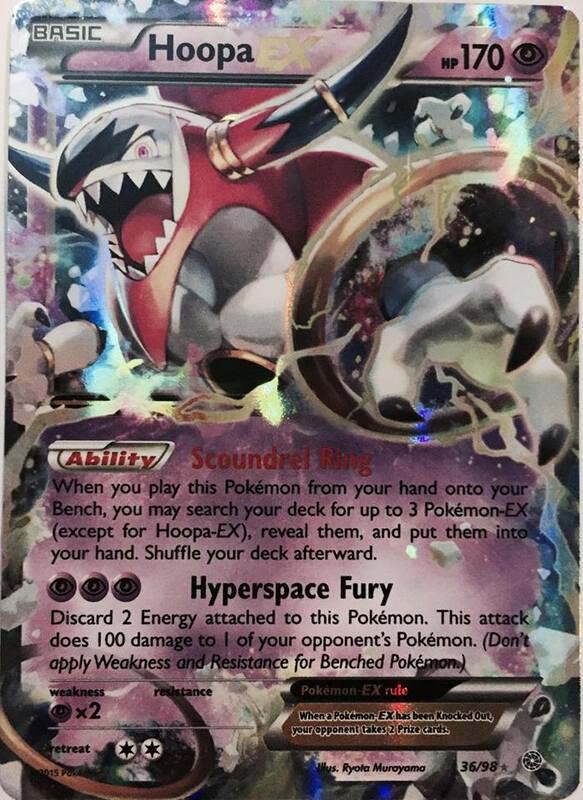 Hoopa EX is a Psychic type Basic Pokemon with 170 HP, a Psychic weakness, no resistance, and a two retreat cost. Its Ability, Scoundrel Ring, says “Once during your turn (before your attack), when you play this Pokemon from your hand to your bench you may use this Ability. Search your deck for 3 Pokemon EX (excluding Hoopa EX), show them to your opponent, and put them into your hand. Shuffle your deck afterwards. Its attack, Hyperspace Fury, costs [P][P][P] and does 100 damage to one of your opponent’s Pokemon and you have to discard two Energy from Hoopa. This is purely a utility Pokemon, and it’s a good one at that. In any EX heavy deck, Hoopa should be a near automatic inclusion. It can turn each of your Ultra Balls into four Pokemon total, three of them being for Pokemon that are meant to advance your strategy. I think they made Hoopa EX with the M Rayquaza EX/Shaymin EX archetype in mind. That deck, while pretty fast, never felt like it had the consistency that the makers were hoping it to have. I think they realized this and designed Hoopa EX to advance the archetype further. Being able to get both pieces of the M Rayquaza EX line and a Shaymin EX out of one Ultra Ball is very strong and should help the deck fill its bench quicker. Beyond M Rayquaza decks, I think it will work very well in any Mega Pokemon deck, making them much more consistent than they currently are. As of now, its attack is near impossible to setup so it likely will have no effect. Hoopa EX will be released in a tin this fall. Giratina EX is a Dragon type Basic Pokemon with 170 HP, a Fairy weakness, no resistance, and a three retreat cost. Its Ability, Renegade Pulse, says, “Prevent all effects of attacks, including damage, done to this Pokemon by your opponent’s evolved Mega Evolution Pokemon. Its attack, Chaos Wheel, costs [G][P][C][C] and does 100 damage and says your opponent can’t play any Pokemon Tool, Special Energy, or Stadium cards. This is one of our first Mega hate cards, but I’m not sure how effective it will actually be in that goal. They can play a Silent Lab before you Chaos Wheel and knock it out that way. 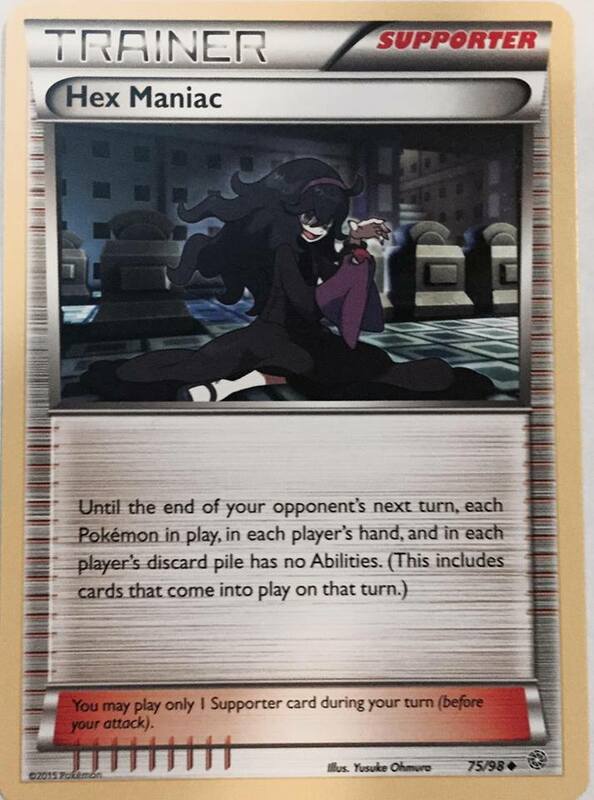 After Chaos Wheel has taken place, they can play Hex Maniac to shutoff the Ability to attack into it with a Mega. Alternatively, Mega Pokemon such as M Manectric EX and M Sceptile EX have capable regular EX’s that could try to take down a Giratina EX without help from the Mega. 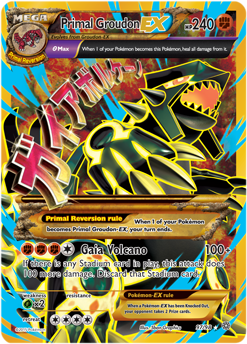 Even something like Groudon EX could be disruptive against Giratina EX by stripping away Energy with Rip Claw. 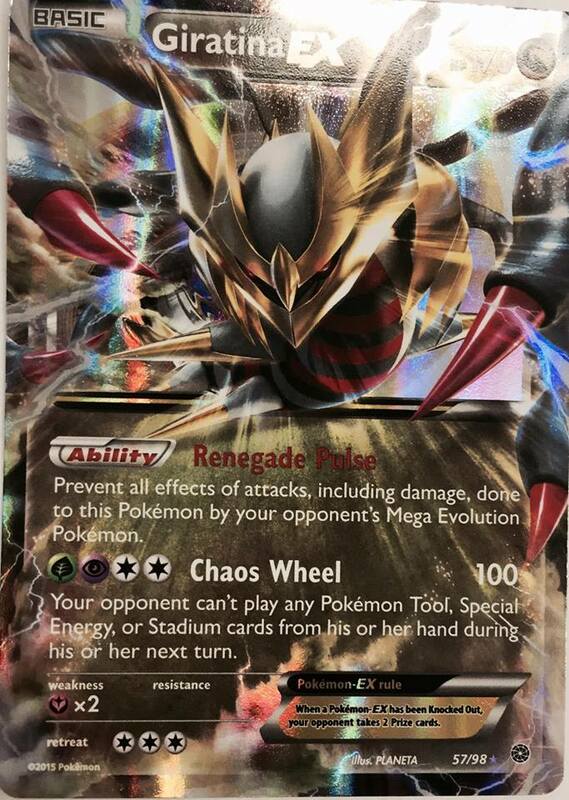 I think it is good and will punish players who don’t think through of how to deal with such an Ability, but I think Mega decks can easily be built in ways that help them deal with Giratina EX’s Ability. Chaos Wheel at four Energy would generally be an attack that would be completely disregarded, but with Double Dragon Energy in the format it can be setup very simply with a Double Dragon and a Double Colorless attachment. Depending on only Special Energy attachments could land you into some trouble though if your opponent plays Enhanced Hammer or Xerosic. One of the biggest hype decks to come out of Ancient Origins is Giratina EX/Vileplume. The idea behind the deck is that you shutoff your opponent’s ability to play anything except Pokemon, Basic Energy, and Supporter cards, ultimately disrupting a deck too much to make it useful. While the idea has some sound theory behind it, I think it will be clunky to a point where decks can take a quick lead on it with cards that are supposed to be bad against it, and then use the window of cards it does allow to be played to finish taking it down. It’s not a deck I’m writing off completely, it may be possible to build the deck in way that it sets up much more consistently, but as far as the builds I’ve seen so far I don’t think the deck will be good enough to be anything more than a Tier 2 deck. I do see a lot of potential for Giratina EX in a Reshiram ROS/Hydreigon EX deck. If you were able to pull off two Turboblaze on the first turn of the game you could use Chaos Veil on the first turn of the game and be in control of the Stadium War and potentially shutting down any Special Energy based strategy from the first turn of the game. I think the extra speed and the available backup attackers available using a Dragon based strategy could make for a better, more consistent Giratina EX deck than the Vileplume variants people are trying. You don’t shutdown as much stuff, but shutting off Stadiums, Tools, and Special Energy from turn 1 on is still very disruptive. Giratina EX is definitely a strong card, but it’s going to take some time for players to figure out how to best use it. In its life, I think it will spend some time as part of Tier 1 decks. Vespiquen is a Grass type Stage 1 Pokemon with 90 HP, a Fire weakness, no resistance, and a free retreat cost. Its first attack, Intelligence Gathering, costs [C] and does 10 damage and lets you draw cards until you have 6 cards in hand. 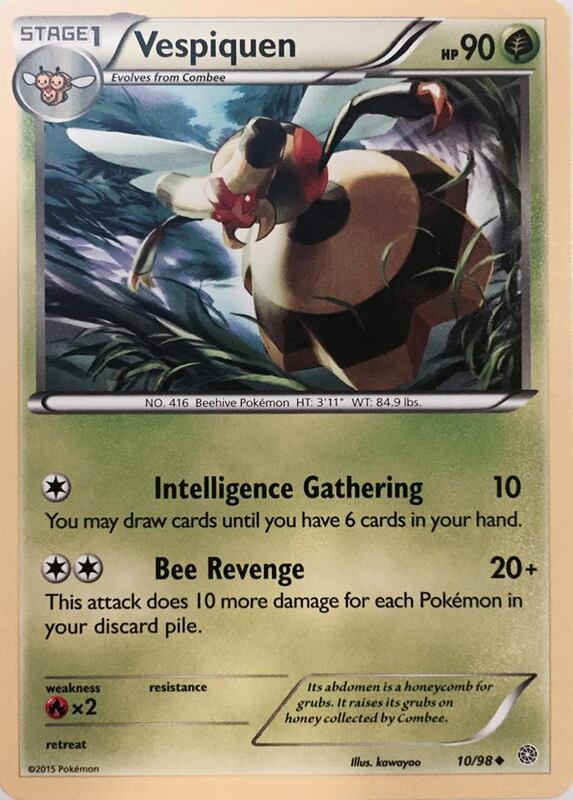 Its second attack, Bee Revenge, costs [C][C] and does 20 damage plus 10 more damage for each Pokemon in the discard pile. This is one of those cards that you know will be good without doing any guess work. It functionally forms the same deck as Flareon PLF, which is still a solid deck in the current Standard format, finishing 26th overall at the US National Championship. In many ways Vespiquen is a much better deck than Flareon ever was. It has a free retreat, so you can easily get it out of the Active slot when you whiff the Double Colorless Energy. It has a usable first attack that can help the deck get setup. 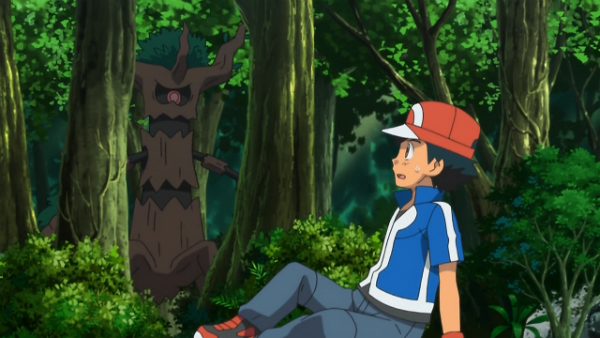 Being part of a Grass evolution line, it can use Forest of Giant Plants to evolve instantaneously. It received the Eeveelutions in the same set that it’s released in, allowing it to not only hit for Grass weakness but also Fire, Water, and Lightning weaknesses. 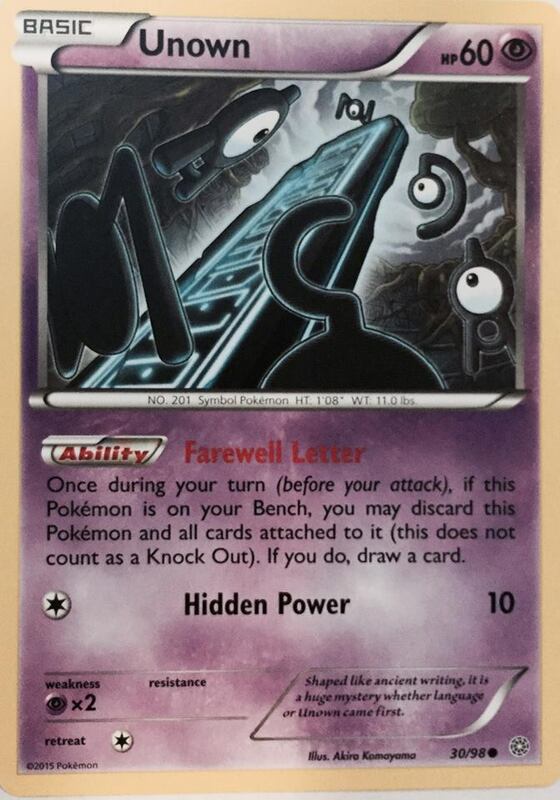 Lastly, it also received Unown in the same set, giving it a Pokemon that can be sent to the discard pile under Item lock while also giving you some draw. I expect Vespiquen to be one of the best decks in the Standard format and also be a contender in Expanded. Vileplume is a Grass type Stage 2 Pokemon with 130 HP, a Fire weakness, no resistance, and a three retreat cost. 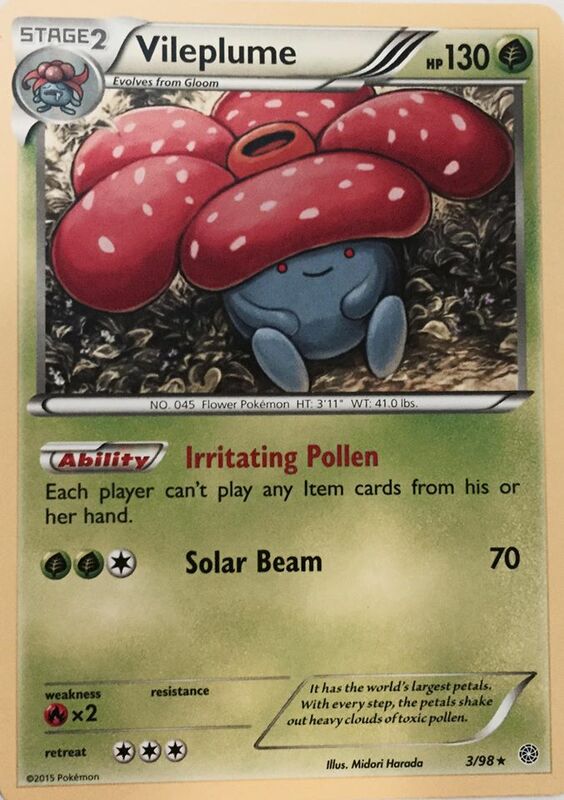 Its Ability, Irritating Pollen, says, “As long as this Pokemon is in play, both you and your opponent can’t play any Item cards.” Its attack, Solar Beam, costs [G][G][C] and does 70 damage. 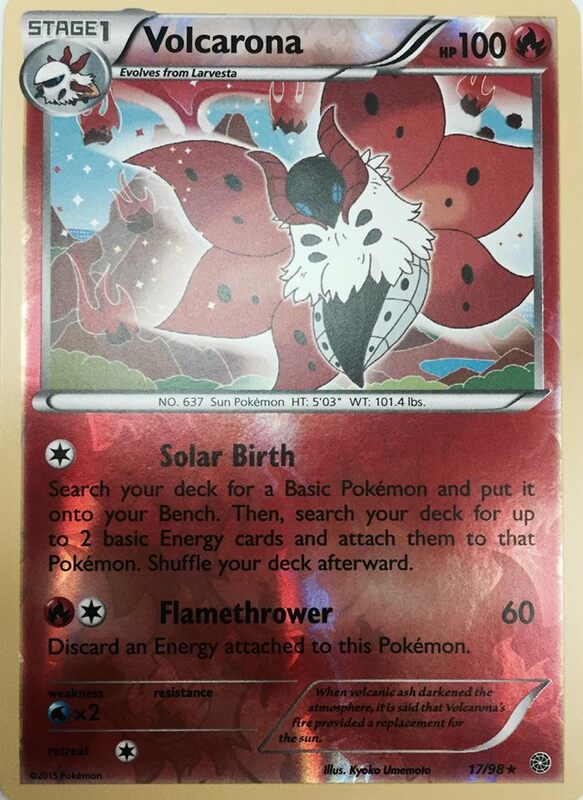 This is a functional reprint of Vileplume UD and Dark Vileplume. Last time Vileplume was in rotation it was in some really strong and cool decks that saw a lot of success. These decks include DonChamp/Vileplume, The Truth, Bear Hug, VVV, Lilligant, Chandy Beach, and Chandelure NVI/Accelgor DEX, in addition to even more decks from before my time. What Vileplume does for you is give you control over the game, similar to other Item lock decks, in particular Seismitoad EX this past season, but at the same time gives you much more freedom in your deck strategies because you can use any other attacker in the format while maintaining Item lock. The downside of course is that you can’t play your own Item cards, but you choose Pokemon for your strategy that aren’t reliant on Item cards and construct your deck in a manner that is favorable to playing with very few Item cards. You can actually get Vileplume into play on the first turn of the game with Forest of Giant Plants, but I’m not sure how effective of a strategy this will end up being, as you would want to play more Item cards to get it out quickly than a Vileplume deck would normally want to play. I think the best way to do it would just to play a semi-thick line of Vileplume and hope by playing the higher counts of things like Gloom you just draw into the rest of the line on the first turn of the game. While I think Vileplume will find plenty of success, it would be foolish to ignore that there is much more hate towards Vileplume this time around than there was in the Heart Gold Soul Silver era. Hex Maniac and Wobbuffet can both shutoff the Ability, allowing your opponent to play Items again. 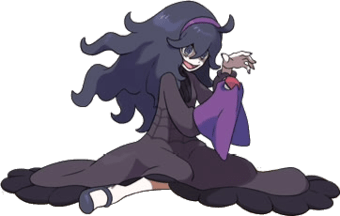 I’m not overly worried about Hex Maniac against Vileplume, because if they used that for their Supporter they won’t be able to get any more draw out of their turn, so they will be limited to what they have in hand that turn unless they’re playing draw Items. This works well for a deck like Vespiquen, which can regain access to Battle Compressor when they break the lock, but for most decks, there won’t be too many useful things to do with that turn of Items. Wobbuffet is more problematic, because your opponent can promote it Active to shutoff Vileplume’s Ability, letting them use their Items to get setup, and then transition out of it when it’s no longer needed. While these cards that shutoff Abilities are an annoyance to Vileplume, they could also be used in conjunction with Vileplume to allow Vileplume decks to use Item cards as part of their own strategies as well. Lysandre also will provide a reliable means to drag Vileplume into the Active position, and with a higher retreat cost this time around getting Vileplume out of the Active won’t be as simple as attaching a DCE and retreating. The go to means for getting a Vileplume out of the Active will be using AZ to pick up the entire Vileplume line. If Forest of Giant Plants is in play, you can then just re-evolve into Vileplume immediately. In Expanded, you can place some Float Stones onto your Oddish and Gloom before your evolve into Vileplume, or also get Vanilluxe NXD into play as a means for getting Vileplume out of the Active spot. I’m not sure what a good Vileplume deck will look like yet, but I’m sure we will see some cool stuff be paired with it in the next few years. M Sceptile EX is a Grass type Mega Pokemon with 220 HP, the Theta Stop trait, a Fire weakness, no resistance, and a two retreat cost. Its attack, Jagged Saber, costs [G][C] and does 100 damage and you may attach 2 Grass Energy from your hand to your benched Pokemon in any way you like. If you do, remove all damage from each Pokemon you attached them to. 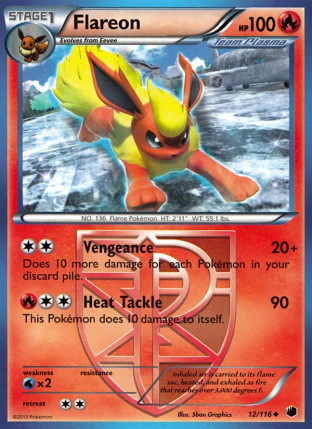 This is a card that I felt had to be mistranslated when I first read it, as just being able to accelerate Energy with a two Energy attack is very strong, but being able to heal all damage from your Pokemon is ridiculously strong. Energy acceleration from the hand is less consistent than acceleration from the discard or deck, but with Energy Retrieval and Energy Recycler in the format there will be plenty of ways to keep the Energy flowing. 100 damage is an awkward number to hit for, as it doesn’t cleanly OHKO non-EX big basics, even with the extra poison damage from Ariados. It may be worthwhile to play Tool Retriever to allow you to put Muscle Band onto M Sceptile to hit cleaner damage numbers. In Expanded, Masquerain could be a very good option since you can evolve into it instantly with Forest of Giant Plants. This attack is particularly strong since you can use it on the first turn of the game by evolving with Forest of Giant Plants and a Spirit Link, but it will be a bit clunky to work out, as you will need the Spirit Link and the Stadium, then evolve into M Sceptile, and then you can only use Mega Turbo after doing all that, as well as getting an Energy into the discard pile to attach with that Mega Turbo. I think it will work in conjunction with Sceptile EX very well. You can get two Sceptile EX an attachment away from being ready to attack with Jagged Blade and then use Assassin Claw to hit better damage numbers, cycling between Sceptile EX for big attacks and Jagged Blade for healing. M Sceptile seems like it could have some major issues with some of the other Mega Pokemon. It probably won’t be able to trade very well with something like M Tyranitar EX which it needs to 3HKO, or M Rayquaza EX which it can 2HKO with Poison damage, but who would knock it out every turn of the game. Lugia EX is a Colorless type Basic Pokemon with 170 HP, a Lightning weakness, a Fighting weakness, and a one retreat cost. Its first attack, Aero Ball, costs [C][C] and does 20 damage times the amount of Energy attached to this Pokemon and the Defending Pokemon. Its second attack, Deep Hurricane, costs [C][C][C][C] and does 80 damage and if there are any Stadium cards in play you do 70 more damage and discard that Stadium card. 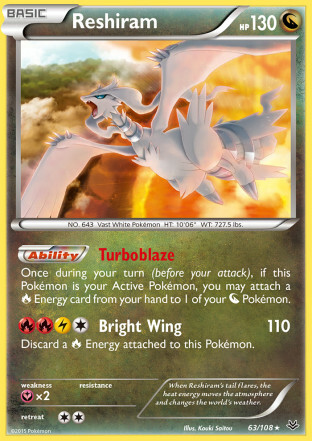 Lugia follows in the footsteps of Mewtwo EX and Yveltal EX as Pokemon that punish the opponent for using Pokemon with attack costs that take a lot of Energy. 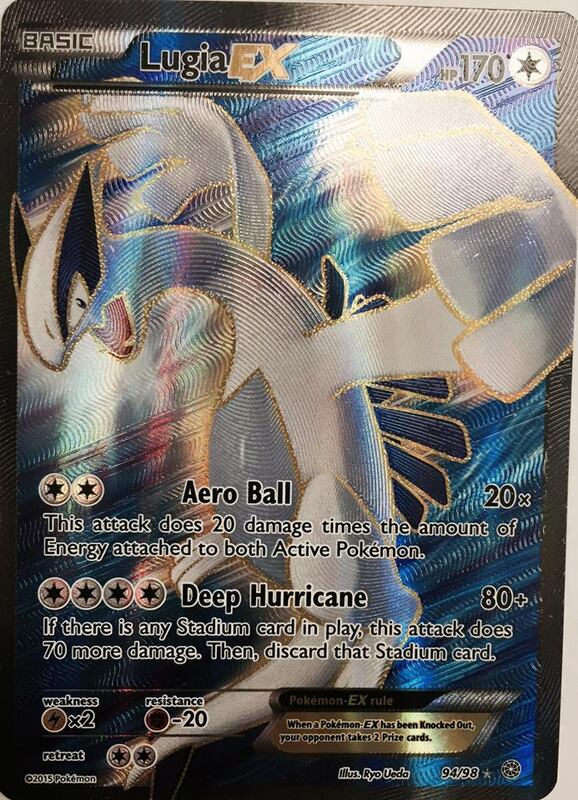 I believe Lugia EX has the potential to be stronger than both of them because Deep Hurricane is the best second attack out of all of these cards. With a Muscle Band attached, Lugia can do 170 damage with Deep Hurricane, good to knockout a lot of EX’s. I think Lugia EX will be best played in the Standard format with Bronzong PHF. It can easily replace Dialga EX, as it will have the same damage output as Full Metal Impact as long as there is a Stadium Card in play, while marrying that damage output with unlimited damage output with Aero Ball, which should be more effective than Chrono Wind as a first attack. While Lightning weakness is somewhat problematic, Altaria ROS can be teched into decks to completely wipe away Lugia’s weakness allowing it to attack against a wide array of decks uninhibited. While Mewtwo EX and Yveltal EX have been seeing less play, I think that is a combination of an upswing in Lightning Pokemon taking advantage of Yveltal EX’s weakness (Lugia can rid itself of this problem of course) and a bit of a power creep that Mewtwo EX didn’t quite keep up with last season. Even though Mewtwo saw less play as the card pool got deep, Mewtwo EX still managed to get 4th place at US Nationals in Ben Moscow’s Bronzong deck and also finished 16th place in Kolton Day’s Seismitoad EX/Crobat PHF deck. M Tyranitar EX is a Dark type Mega Pokemon with 240 HP, the Theta Double trait, a Fighting weakness, Psychic resistance, and a four retreat cost. Its attack, Destroyer King, costs [D][D][C][C] and does 110 damage plus 60 more damage for each damage counter on the Defending Pokemon. 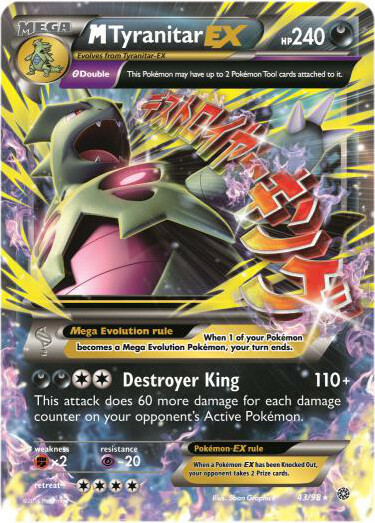 M Tyranitar is truly the Destroyer King, and that’s why it’s our top card from Ancient Origins. When there are two damage counters on the Defending Pokemon, M Tyranitar is doing 230 damage, which knocks out almost everything in the game. If you put three damage counters on something, then you do 290 damage, which will even get you through other M Tyranitar EX’s, Primal Groudon EX, and that pesky Wailord EX. I think the best way to play it will be with a Crobat PHF line. A single Sneaky Bite from Golbat will let you OHKO almost every Pokemon, and a Surprise Bite from Crobat would let you OHKO every Pokemon in the game. In Standard, you can setup M Tyranitar EX fairly easily on turn 2 of the game. You would be able to do this by attaching an Energy turn 1, and then attaching again on turn 2 (one of these attachments should be a DCE) and then playing a Mega Turbo. In Expanded, you can play Dark Patch instead of or in addition to Mega Turbo, letting you accelerate to the Basic Tyranitar EX and make better use backup attackers like Yveltal EX and Darkrai EX. Dealing with Pokemon with Theta Stop will take a little more work since you can’t affect them with the Crobat line’s Abilities, but it won’t be impossible to take down at all. 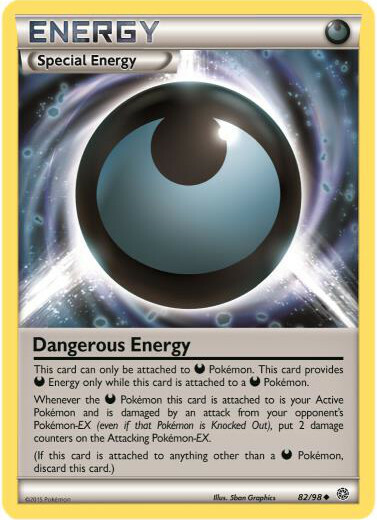 Dangerous Energy, the new Special Energy for Darkness Pokemon puts 2 damage counters on an attacking Pokemon EX when the Pokemon Dangerous Energy is attached to is damaged by that EX’s attack. That means that with Dangerous Energy attached, M Sceptile would be able to be KO’d by Destroyer King as it would place two damage counters onto M Sceptile. The non-EX Pokemon with the trait are less difficult to deal with because they have less HP so you can just knock them out easier. In Expanded, Rocky Helmet would be another option for getting this extra damage on board. Alternatively, you could use mini Yveltal to use Oblivion Wing to place 30 damage on a Pokemon while also accelerating Energy to help get M Tyranitar EX setup. One of the things that makes M Tyranitar so special is that it has the Double Theta trait, which will let it have a Spirit Link that it had used to evolve in addition to another tool. The top two tools for this role seem like they would be Lucky Helmet, which lets you draw two cards when the Pokemon it is attached to is damaged from an attack, and Weakness Policy, which could be used against Fighting decks to take away M Tyranitar’s weakness. Hard Charm also could be a good inclusion whenever M Rayquaza decks are a large part of the meta game. It’s pre-evolution isn’t very strong, but I guess that’s okay when you get a Mega as strong as M Tyranitar EX is. Ancient Origins is a very strong set full of very strong Pokemon and Trainer cards that will affect the format for the next few years. Grass Pokemon have received major support, which should make all sorts of Grass Pokemon playable that were previously difficult to play. 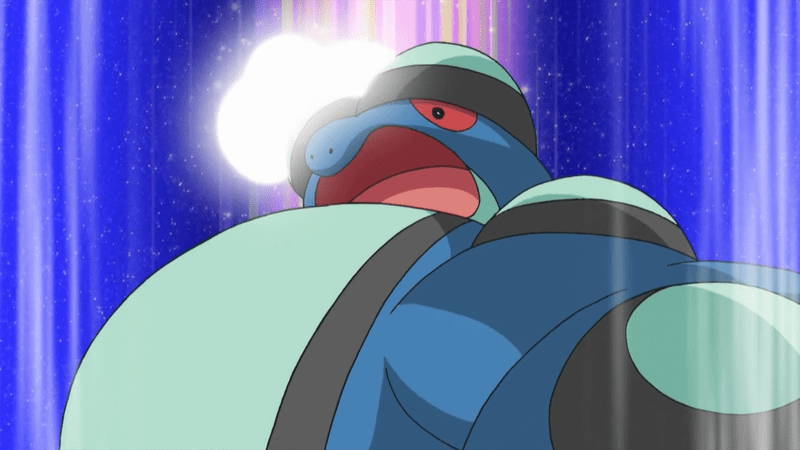 With Grass now being a strong type, Seismitoad EX should see it’s downfall, and it will also be difficult to play any Grass weak Pokemon until the meta shifts away from Grass. Ancient Origins will release in stores on August 12th and go active on PTCGO on the same date. You can pick up the cards right now at your local pre-releases.